Does $\triangle ABC$ exist such that $\triangle ABC \sim \triangle DEF$, with $D, E, F$ being the incentre, centroid, orthocentre of $\triangle ABC$? 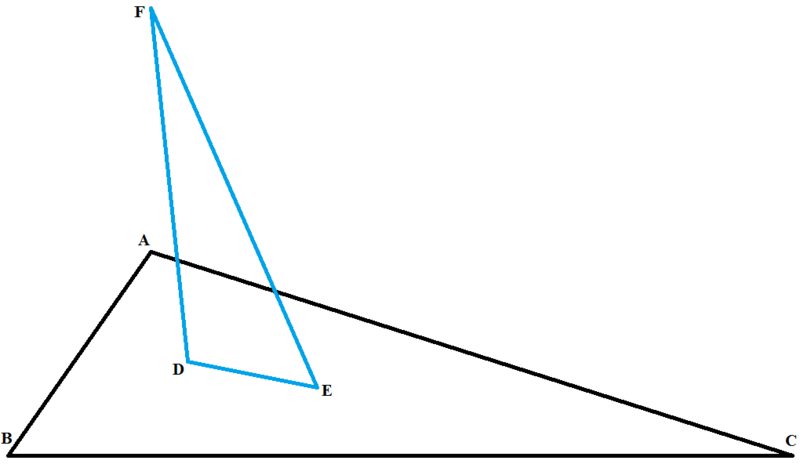 Does $\triangle ABC$ exist such that $\triangle ABC \sim \triangle DEF$, with $D, E, F$ being the incentre, centroid, orthocentre of $\triangle ABC$, resp.? For such a triangle to exist, it must be obtuse. Besides that, I have no idea how to prove or disprove it. For the case of $D, E, F$ being the orthocentre, centroid, circumcentre, it's impossible as they lie on the same line (Euler's line). That's the motivation of the problem. I have a feeling that brute force methods are needed (coordinate geometry). But I hate such an ugly approach. Any idea? Without loss of generality, let's choose an appropriate scale such that $AB=1$. And I've no idea how to solve it with bare hands. Feel free to complete my answer. I'm curious whether there is a purely geometric approach (maybe non-constructive). Not the answer you're looking for? Browse other questions tagged geometry euclidean-geometry triangles or ask your own question. If the equation of side BC is $2x-y=10$,then find the possible coordinates of vertex A. Proving that the orthocentre of an acute triangle is its orthic triangle's incentre. Problem about incentre of a triangle.